Kikuo Saito (1939–2016) was a Japanese American abstract painter with ties to the Color Field tradition. 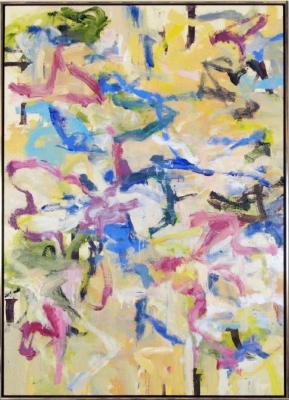 Born in Tokyo, he came to New York City in 1966, where he worked as an assistant for such eminent painters as Helen Frankenthaler, Kenneth Noland, and Larry Poons. Saito’s work infuses richly saturated colorscapes with delicately drawn lines. Saito was the creator of sui generis theatre and dance events, working under Ellen Stewart at La MaMa Experimental Theatre Company and collaborating with innovative and influential directors and choreographers Robert Wilson, Peter Brook, Jerome Robbins and Eva Maier. Saito’s paintings have been featured in numerous solo and group shows worldwide, and are in the permanent collections of the Museum of Modern Art, the Aldrich Contemporary Museums, and numerous private and corporate collections. To order any of Kikuo’s work please complete the form below stating Kikuo Saito‘s name in the message area and I will contact you as soon as possible. Or call Judy Ferrara directly at 1-574-276-6001.